At one end of the Esplanade are David Newton’s re-creations of Laurence Tenney Stevens’ original sculptures—Contralto in the foreground and Tenor in the background. Let’s say you’re among the millions of people who visit Fair Park in Dallas for the State Fair of Texas each year. Maybe you’ve admired the prize livestock and indulged in the over-the-top culinary concoctions (fried Oreos, anyone?). Maybe you’ve taken in a bird’s-eye view of the festivities from the 212-foot-tall Texas Star Ferris wheel, or strolled through the automobile building dreaming of a new ride. The State Fair of Texas takes place Sep. 30-Oct. 23, but the grounds open daily year-round, including for many special events on week-ends. Friends of Fair Park offers information and maps for self-guided walking tours (cell-phone narration available) on its website, www.fairpark.org. The Dallas Center for Architecture leads free Fair Park walking tours on the third Wednesday of the month, Feb-Jun and Sep-Nov.
See more photos of Fair Park’s architectural touches. But if you’ve only been during the State Fair, you probably haven’t really seen Fair Park. Playing host to all the action is the world’s largest collection of Art Deco exposition buildings in existence. Add to that an impressive array of painted murals, sculptures, and bas-reliefs across the 277-acre campus, and you have a noteworthy concentration of art and architecture that can be enjoyed any time of year. Preferably on a day when there are no corny dogs in sight. The site was used as fairgrounds as early as 1886 and its oldest buildings date to 1905, but Fair Park as we know it was built in 1936 to host the Texas Centennial Exposition, a world’s fair celebrating the 100th anniversary of Texas’ independence. Dallas architect George Dahl led a team of colleagues in the ambitious charge to update existing buildings with Art Deco facades and to create dozens more from the ground up, many adorned by the work of notable contemporary artists. Standing at the Parry Avenue gate, where DART rail cars have replaced the street trolleys that once delivered visitors to Fair Park, it’s easy to appreciate Dahl’s vision. Guests first encounter the grand esplanade, anchored by a 700-foot-long fountain with hundreds of water jets that put on regular shows set to songs like “The Yellow Rose of Texas.” Looking between parallel rows of live oaks, beyond the fountain, the imposing Hall of State emerges into view. While many Fair Park buildings were fashioned of concrete blocks—an upgrade from the intentionally temporary construction techniques common to world fairs of the day—the Hall of State was built of Texas limestone. Art and architecture buffs can access a self-guided tour from the Friends of Fair Park website. There’s also a cell-phone tour—look for the blue-and-white signs—for those who want to hear historical highlights at any of 63 stops within Fair Park. At press time, a Fair Park app was nearing release, too. Noticeable symmetry emerges along the esplanade. All together, six porticos face the fountain, three per side, each with a sculpted stone figure representing one of the nations that has flown its flag over Texas—Spain, France, Mexico, the Republic of Texas, the Confederacy, and the United States. 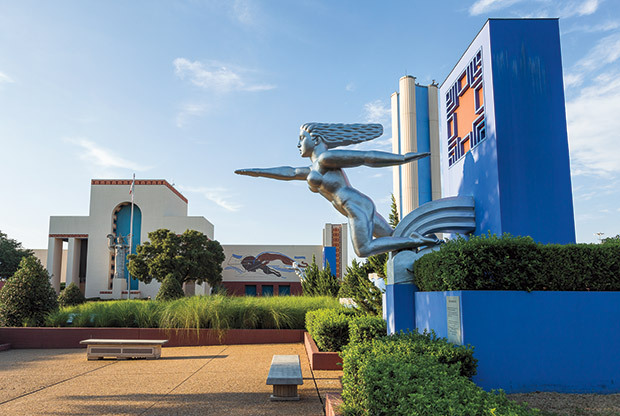 Throughout Fair Park’s art and architecture, references to these six flags fly up time and again. There’s a distinct difference between the left and right sides of the fountain. Wander first up the left side of the esplanade, where the covered walkway along Centennial Hall features a series of large murals by Italian artist Carlo Ciampaglia depicting various modes of transportation. In a cringe-inducing historical moment, they were painted over shortly after the 1936 exposition. But a renovation in 2000 uncovered many of the original murals, which had been well preserved under nu-merous layers of paint. Scenes include statuesque bare-breasted women, typical of the Art Deco style, unfurling scrolls that reveal the evolution of automobile designs; muscular men in a vignette of historic and modern train travel; and, incredibly for the day, a rocket ship blasting out from earth into the atmosphere, guided by angels. At the end of the esplanade fountain, the silver-finished Tenor and Contralto bronzes—depicting muscled male and female nudes—spring from the pylons on either side. Lawrence Tenney Stevens created the bronzes for the Centennial, but they were removed not long after the exposition. Friends of Fair Park commissioned David Newton to re-create the dynamic duo based on photographs of the originals; they were installed in 2009. From the fountain’s end, it’s a short walk across the street to reach the forementioned architectural prize—the Hall of State. The product of a consortium of prominent architects who Brown says couldn’t agree on anything, the Hall of State was brought together in the end by architect Donald Barthelme. Brown points out that while Barthelme didn’t get credit for the building at the time, he nearly managed to spell out his last name on its frieze—if you follow the first letter of the Texas heroes’ names across it (Burleson, Archer, Rusk, Travis, and on). Also notable on the building’s exterior is the larger-than-life Tejas Warrior, a statuesque bronze covered in gold leaf by Allie Tennant. Inside, the Hall of State displays a visual feast in celebration of Texas. Straight ahead is a massive gold seal with the Texas star; on either side of the Great Hall, with its 46-foot-tall ceilings, Eugene Savage’s murals detail Texas history. The works are so large, says Brown, that Barthelme created columns along the sides of the room to frame the mural scenes—from the arrival of the Europeans in the 1500s through 1936—into more manageable bites. When it’s time for lighter fare, a short walk southeast leads to Fair Park’s scenic Leonhardt Lagoon. During the Centennial, visitors test-drove Ford’s latest models around the lagoon. Today it has a pair of giant sculptures, a tangle of wide, flat tentacles—Patricia Johanson’s 1986 Sagittaria platyphylla (Delta Duck-Potato) and Pteris multifida (Texas Fern)—that curve around and into the water; they serve as snaking paths. On weekends, the park rents swan-shaped paddle boats on the lagoon. Nearby, more Art Deco buildings house year-round attractions, including the Children’s Aquarium at Fair Park, with piranhas and small sharks whose feeding time proves entertaining, and the Texas Discovery Gardens. It’s hard to believe that Fair Park could feel empty when it brings in roughly 5 million visitors annually, but the sprawling campus does feel a bit like a ghost town at times. Yet in addition to the State Fair and about a dozen annual festivals, fans regularly pour into the Cotton Bowl for football and soccer, into Gexa Energy Pavilion for rock and country concerts, and into the Music Hall for Dallas Summer Musicals and other shows (heads up: Leon Bridges plays September 18).